When people ask me about a particular movie, they don't say, "Are the performances transcendent?" Or "is the direction sublime?" Or "is this an engrossing, life-enriching experience?" They ask, "Is it any good?" That's what they always say. I can't tell you with a straight face "Broken City" is "any good," but I can make the case you'll have a good time even when the screenplay is breaking bad. You look at that cast — Oscar winners Russell Crowe and Catherine Zeta-Jones, Oscar nominee Mark Wahlberg, terrific supporting players such as Barry Pepper, Kyle Chandler, Jeffrey Wright and Griffin Dunne — and you figure at least some of these actors read the script, and thought, OK, I'll sink my teeth into this one, even if the cheese gets pretty binding at times. From a lurid plot sometimes so predictable they could have inserted subtitles issuing a spoiler alert warning of Russell Crowe's thuggishly over-the-top performance as a power-thirsty New York mayor, "Broken City" is the sworn enemy of subtle. Directed by Allen Hughes (who has teamed up with his brother on films such as "Menace II Society," "From Hell" and "The Book of Eli"), this is a big, juicy, sometimes clunky political crime thriller that plays like a 21st century B-movie. It's pretty trashy and sometimes stupid. But there was never a moment when I wasn't entertained on one level or another. Mark Wahlberg has the Mark Wahlberg role as Billy Taggart, a streetwise, temperamental but basically goodhearted New York City cop who's forced to resign from the force after a controversial shooting. Flash forward to seven years later. Billy is scraping out a living as a low-level private detective — peeping into windows, taking photos of guys cheating on their wives, that sort of thing. Not that life is too rough. Waiting at home for him, with candles and warm baths and many kisses, is the beautiful, aspiring actress Natalie (Natalie Martinez), who fell in love with Billy when he came through for her family after they suffered a horrific tragedy. Still, Billy jumps without thinking when he gets a call from Mayor Hostetler (Crowe), who summons Billy to his richly paneled office and offers him a tricky job with a big payday. Boom! Just like that, Billy is plunged into a world of relationships that aren't what they seem (though we usually figure that out well before Billy does), shady political deals and a mayoral campaign so vicious Rahm Emanuel would be shaking in his shoes. Hostetler's more like a beefy, modern-day Nucky Thompson than a slick politician, his eyes in permanent malevolence mode as he stomps through the city like Godzilla in Prada. Hostetler's wife, Cathleen — played by Catherine Zeta-Jones as if she watched one too many 1950s film noirs in her trailer while getting her hair and makeup done — is up to something shady. Is she having an affair, as the mayor claims, or is it something deeper? Well, she actually pulls Billy aside at one point and basically tells him what's going on, but he still doesn't buy it. Come on, Billy! We also get Jeffrey Wright as the police commissioner, whose intentions are well disguised; Barry Pepper as Hostetler's opponent, whose name is actually Jack Valliant, I kid you not, and Kyle Chandler as Jack's slick campaign manager. Meanwhile, there's a mostly irrelevant subplot about Billy's girlfriend and the seemingly NC-17 indie film she's doing, and did I mention Billy hasn't had a drink in seven years but he's about to fall off the wagon? Oh, and there's a lot of flirtatious banter between Billy and his gorgeous, wise-cracking assistant, played by Alona Tal. (Now there's a name, Jack Valliant!) I looked up Alona Tal because she's such crackerjack fun in "Broken City." According to the Internet Movie Database, she was born in Herzlia, Israel, once recorded a song with Wyclef Jean, came in second for the role of "Veronica Mars" and served in the Israel Defense Forces. So there's that. 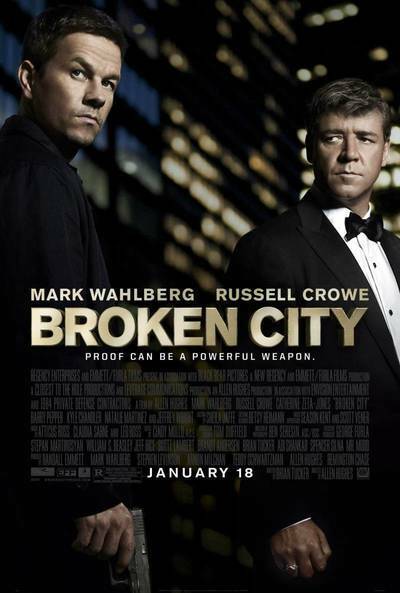 Back to the madness of "Broken City." Hostetler stands to make millions from one of those real estate deals that will evict thousands of poor people and make way for luxury condos. Billy's hot on the trail, but he can't see the forest for the trees. Just about everyone is hiding one secret, if not more. Shots are fired, punches are exchanged, speeches are speechified. Like many a movie villain, Crowe favors his dog over people. It's a pretty great performance from Crowe, as he throws his ham hands about and lectures everyone who comes within shouting distance. Wahlberg is solid, Wright puts his usual unique spin on his role, and Chandler is so good you want to see more of his character. This is the kind of cliche-riddled movie where people print out incriminating documents just so someone can find them, and a falling-down-drunk character miraculously sobers up when he's summoned to a crime scene. Is it any good? No. But yeah.